I need to organize my crafting stash. Some kind of system that makes it easier to know what I have on hand would be wonderful. So I thought why not scan all my patterns envelopes and put the information in a database on the new mac computer. After scanning 4 boxes of patterns I am ready to give up on the project. I didn’t think I had so many. 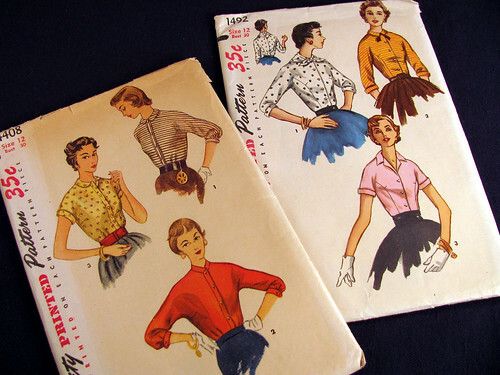 I did find some cute ones like these 1950’s blouses. Notice that a size 12 is a 30 inch bust. Women must have been much smaller back then. I wonder what a tight fitting dolman sleeve feels like to wear. Now dolman sleeves are usually cut full, almost to the waist at the armseye. These blouses are really fun. My favorite is the poka-dotted one with the scarf collar. I just noticed the white gloves too. The pattern on the left is from 1953 and the one on the right is from 1956. This entry was posted on Tuesday, February 24th, 2009 at 3:00 am and is filed under Sewing. Tagged: Clothing, Sewing. You can feed this entry. You can leave a response, or trackback from your own site.